Selling itself as the 'Land of Fire', Azerbaijan (Azrbaycan) is a tangle of contradictions and contrasts. Neither Europe nor Asia, it's a nexus of ancient historical empires, but also a new nation rapidly transforming itself with a super-charged gust of petro-spending.In the surrounding semi-desert are mud volcanoes and curious fire phenomena. Yet barely three hours drive away, timeless rural villages, clad in lush orchards and backed by the soaring Great Caucasus mountains are a dramatic contrast. In most such places, foreigners remain a great rarity, but in return for a degree of linguistic dexterity, you'll find a seam of hospitality. Azerbaijan Overview :Azerbaijan, the Land of Fire, combines the historical, mysterious and exotic with hospitable locals who can never do enough to help a tourist. The government recently made it easier to visit Azerbaijan by introducing an eVisa and after oil prices fell, the country suddenly became a very affordable destination. Here are a few reasons to visit this little-explored nation in the Caucasus. Arrival at Airport .Transfer from Airport to Restaurant. Drive to Hotel. Check inn Hotel. Our tour program starts with Panoramic Tour Highland Park-Alley of Martyrs, The National Assembly- also transliterated as Milli Majlis, Flame towers- the tallest skyscraper in Baku .Later you will visit Baku Crystal Hall - an indoor arena in Baku, Azerbaijan. Located on the coast of Baku near National Flag Square, construction of the arena began in August 2011 and finished in April 2012—in time for it to host its first major event, the 2012 edition of the Eurovision Song Contest . Breakfast in Hotel .Drive to FIRE WORSHIPPERS’ TEMPLE- The most famous fire temple is the well-preserved temple Ateshgah (the Fire Place) in Surakhany, The temple was built over a pocket of natural gas that fuelled a vent providing an eternal fire. Trip to FIRE MOUNTAIN ;Yanardag -a mountain on Absheron peninsula, 25 km from north of Baku.Literally, word-Yanardag means Blazing mountain .Blazing bodies of flame dance on stones and floor. Yanardag is a natural gas fire which blazes continuously on a hillside on the Absheron Peninsula on the Caspian Sea near Baku, the capital of Azerbaijan, which itself is known as the land of fire. the first location in Azerbaijan to be classified as a World Heritage Site by UNESCO. Nizami Street known for shopping. 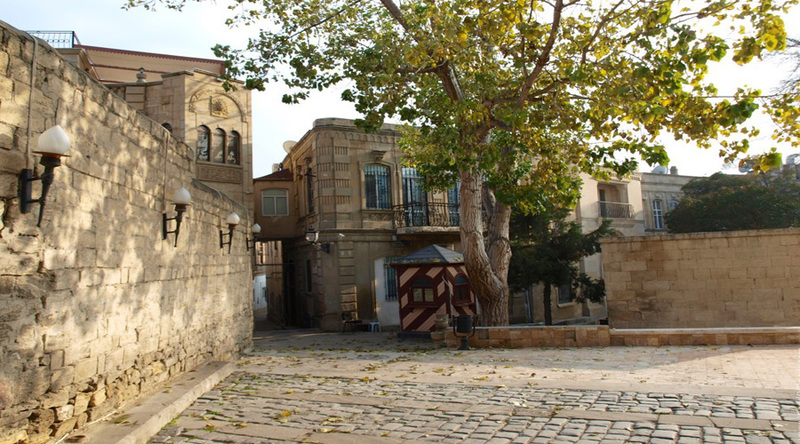 The street's history could be traced back to Baku's town-planning project of 1864. The street runs through the city's downtown from west to east. It begins from Abdulla Shaig Street, in mountainous part of the city and ends at railroad bed on SabitOrujov Street, near a monument to Shah Ismail Khatai in “Black City”. Total length of the street is 3,538 m.
Fountains Square is a public square in downtown Baku, capital of Azerbaijan. The square was previously called Parapet and is often referenced to by the same name now. The name of the fountains square derives from the presence of dozens of fountains throughout the square first constructed during Soviet rule of Azerbaijan. The square is a public gathering place, especially after business hours and during the weekend. Back to hotel. Breakfast at hotel. Check out from the Hotel. Transfer to airport. 9. The prices quoted by the Company in its brochures / quotation are in US Dollars or equivalent in foreign currency (local currency of the foreign country / countries being visited). The Company reserves the right to amend these prices in case of currency fluctuation and changes in various rates of exchange and/or fuel cost before departure, and to surcharge accordingly. All such increases in price in any sector of airlines , hotel, transportation etc must be paid for in full. Even seats reserved on the fare might increase due to taxes or airlines policy over which Skylink plays no role & has no control. 10. Check in / Check out. Most hotels worldwide observe 1400-1600 Hrs. as Check-in time & 1000-1200 Hrs. as Check out time. If the Tourist/Group arrival is before or departure is after the normal check-in or check-out time, the Company is not responsible for additional charges levied by the hotel or travel component supplier and such charges are to be settled by the Tourist/Group directly with the hotel or travel components supplier. April – June :From April to June, the lowlands of Azerbaijan are green and flowers in complete bloom. It is the perfect time to visit this region. July:If you are interested to visit the mountains then July is the perfect time of the year. It is also the popular time for trekking in these mountains. October:To visit Baku, summers should be avoided as it gets extremely hot and humid. October is the best time to visit Baku as the weather is prefect to venture out comfortably.